Open a lidar raster dataset in Python using rasterio and a context manager to handle file connections. Be able to identify the resolution of a raster in Python. Be able to plot a lidar raster dataset in Python using matplotlib. You will need the Python 3.x Anaconda distribution, git and bash to set things up. In this lesson, you will learn how to open a plot a lidar raster dataset in Python. 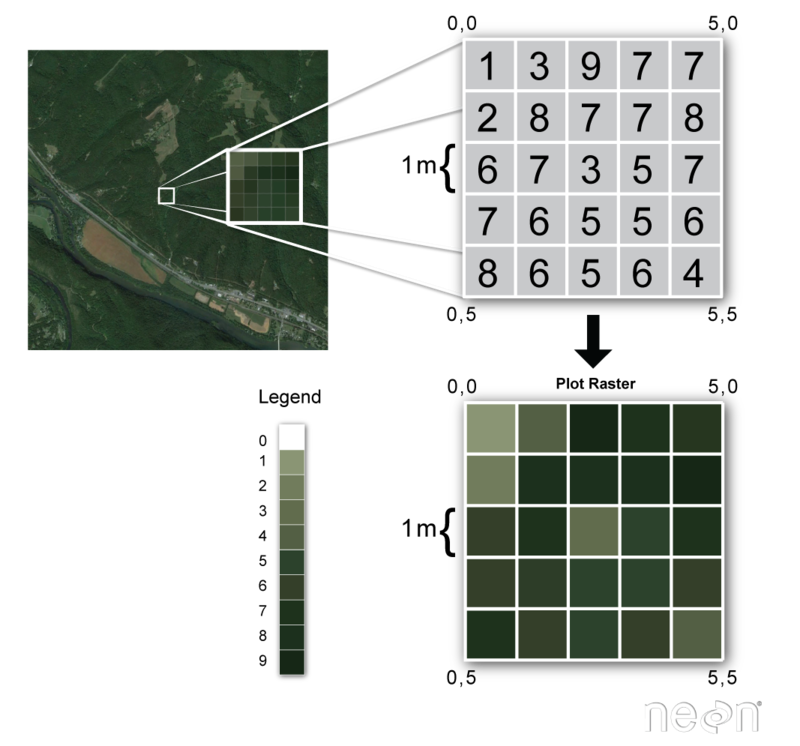 Raster or “gridded” data are stored as a grid of values which are rendered on a map as pixels. Each pixel value represents an area on the Earth’s surface. A raster file is a composed of regular grid of cells, all of which are the same size. You’ve looked at and used rasters before if you’ve looked at photographs or imagery in a tool like Google Earth. However, the raster files that you will work with are different from photographs in that they are spatially referenced. Each pixel represents an area of land on the ground. That area is defined by the spatial resolution of the raster. A raster is composed of a regular grid of cells. Each cell is the same size in the x and y direction. Source: Colin Williams, NEON. Each cell is called a pixel. And each pixel represents an area on the ground. The resolution of the raster represents the area that each pixel represents the area it represents on the ground. So, a 1 meter resolution raster, means that each pixel represents a 1 m by 1m area on the ground. A raster dataset can have attributes associated with it as well. For instance in a LiDAR derived digital elevation model (DEM), each cell represents an elevation value for that location on the earth. In a LIDAR derived intensity image, each cell represents a LIDAR intensity value or the amount of light energy returned to and recorded by the sensor. Rasters can be stored at different resolutions. The resolution simply represents the size of each pixel cell. Source: Colin Williams, NEON. You can use the rasterio library combined with numpy and matplotlib to open, manipulate and plot raster data in Python. To begin you will load a suite of python libraries required to complete this lesson. These libraries are all a part of the earth-analytics-python environment. Next, download the data. This line of code should only be run if you don’t have the data on your computer already! Note that you import the rasterio library using the alias (or shortname) rio. You use the rio.open("path-to-raster-here") function to open a raster dataset using rio in Python. You can quickly plot the raster using the rasterio function, show(). The rasterio library is efficient as it establishes a connection with the raster file rather than directly reading it into memory. Because it creates a connection, it is important that you close the connection after it is opened AND after you’ve finished working with the data! # this returns an error as you have closed the connection to the file. 1 # this returns an error as you have closed the connection to the file. A better way to work with raster data in rasterio is to use the context manager. This will handle opening and closing the raster file for you. Once you are outside of the with statement, you can no long access the src object which contains the spatial raster information. set masked = True to ensure that no data values get translated to nan. only read in the first band of your single band image. If you don’t specify 1 when you read in a raster you will get a 3 dimensional array. You are now ready to plot your data using imshow() and matplotlib. If you provide the spatial extent of the raster to the plot, it will be plotted in the correct spatial location. 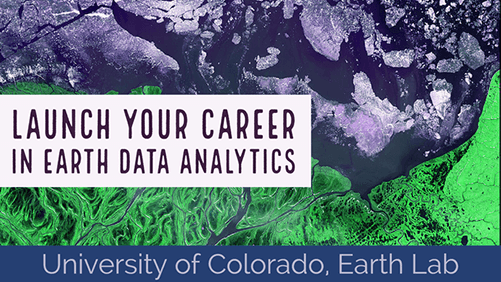 This is important if you plan to overlay another spatial data layer on top of your raster plot. # add a title and adjust the size of the font. Below you tweak the height of your colorbar to ensure it lines up with the top and bottom edges of your plot. To do this you use the make_axes_locatable package from the mpl_toolkits.axes_grid1 library. To plot you can select pre-determined color ramps from matplotlib, you can reverse a color ramp by adding _r at the end of the color ramps name, for example cmap = 'viridis_r'. Next, you will explore a histogram of your data. A histogram is useful to help you better understand the distribution of values within your data. In this case given you are looking at elevation data, if there are all small elevation values and the histogram looks uniform (not too much variation in values) you can assume that your study area is relative “flat” - not too hilly. If there is a different distribution of elevation values you can begin to understand the range of elevation values in your study area and the degree of difference between low and high regions (ie is it flat or hilly?). Is it high elevation vs low elevation? To plot a histogram use the rasterio - show_hist() function. The file that you opened above was an elevation model representing the elvation of a field site in California. Next, open up and plot the file: "data/spatial-vector-lidar/california/neon-sjer-site/2013/lidar/SJER_lidarDSM.tif". If you want, produce a histogram of the data to better understand the range of elevation values in your data.